(CNNMoney) -- Hybrids and electric vehicles were just the beginning. Next up: the mushroom mobile. Ecovative Design, a startup in Green Island, N.Y., is collaborating with the Ford Motor Company (F, Fortune 500) to develop a fungus-based, biodegradable foam for automotive bumpers, side doors and dashboards. 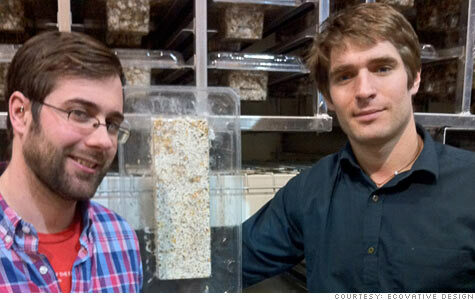 "You would be able to compost your car," says Gavin McIntyre, 25, chief scientist and co-founder of Ecovative. The secret? Mycelium, the strong root system of mushrooms, is a natural binding agent that can knit together agricultural by-products, including corn and oat husks. Ecovative technicians combine the husks and the mycelium in trays of various shapes and sizes. The trays spend five days in a darkened warehouse, long enough for the mushrooms to work their magic, before the rooted mixture is cooked and dried. The result is a fireproof, waterproof foam solid, which decomposes one month after it's been buried in soil. The mushrooms also intrigued Deborah Mielewski, technical leader of plastics research at Ford. The carmaker, which already uses soy-based foam for seat cushions, wants to replace about 30 pounds of petroleum-based foam per car with eco-friendly alternatives. Mielewski is currently exploring a range of bizarre-sounding materials, from Ecovative's mycelium to cooked chicken feathers, algae and wheat straw. Mycelium is impressive because it can be grown in any size or shape and is fireproof, she says. But Ecovative faces some unique challenges, because its manufacturing process relies on the growth of a living organism. The startup must ensure the mycelium can grow consistently, creating a foam of uniform density with no air pockets. "We have to pass these rigorous safety requirements," Mielewski says. "When you're growing a plant, what are the chances that these roots are perfectly consistent throughout?" The Eureka moment: The mushroom tale began in 2006, when McIntyre and his roommate, Eben Bayer, 25, were assigned to create a natural glue for a class at Rensselaer Polytechnic Institute in Troy, N.Y.
Bayer grew up on a family farm in Vermont. He remembered how mushrooms covered the ground in nearby woods. "If you have ever tried to pull a mushroom off a log, you'll see that it's incredibly tenacious," says Bayer, who is now Ecovative's CEO. Over the span of three months, the duo became amateur mycologists, growing mushrooms under McIntyre's bed and in their apartment kitchen. They tinkered with light, trying to grow mycelium without sprouting actual mushroom caps. Finally, a mushroom expert took them for a hike; together, they discovered other mushroom varieties that better fit their needs. They saw a huge opportunity. What if mushroom roots could bind natural substrates into a sturdy, lightweight material? It could ultimately replace the Styrofoam packing materials that are ubiquitous in most consumer goods -- and the bane of landfills. McIntyre and Bayer launched Ecovative Design in 2007. Their largest client is Steelcase (SCS), an office furniture maker that orders thousands of custom foam parts each week to cradle its goods in transit. Total sales hit about $500,000 last year. Ecovative's packaging materials cost about as much as Styrofoam, says Dennis Carlson, the logistics manager for Steelcase. Carlson explored other "green" packaging companies before choosing Ecovative, but found that their makers charged premium prices for products that required significant energy consumption to produce. Mycelium foam, on the other hand, was an affordable, low-energy solution with two additional advantages: it upcycles local agricultural waste and it decomposes on its own in the ground. So how do the business partners staff such an unusual "live" manufacturing operation? Unconventionally. Their 30 employees include a former beekeeper, an architect and diaper factory worker. "Innovation really lies at the intersection of disciplines," says McIntyre, whose own education is in physics and mechanical engineering. Perhaps the most surprising addition to the team is Jerry Weinstein, a retired vice president of Owens Corning (OC, Fortune 500) who built a 40-year career developing polystyrene products -- the same material Ecovative wants to make obsolete. Weinstein joined Ecovative as an advisor and an investor after learning about the company through the newsletter of his alma mater, the Rensselaer Polytechnic Institute. "I'm changing with the times," says Weinstein, 75. "I believe in my heart these guys will be successful."